“Big T Truth” offers big ideas written for the child in each of us. Understanding the concept of Truth can be challenging for adults and children. “Big T Truth” explains the difference between universal truth and personal truth. Little “t” truths are also thought of as opinions. Big T Truth starts gentle conversations about the wonderful differences between people. Each topic introduces a big “T” truth, then begs the question of the reader on what is true for them . . . today. 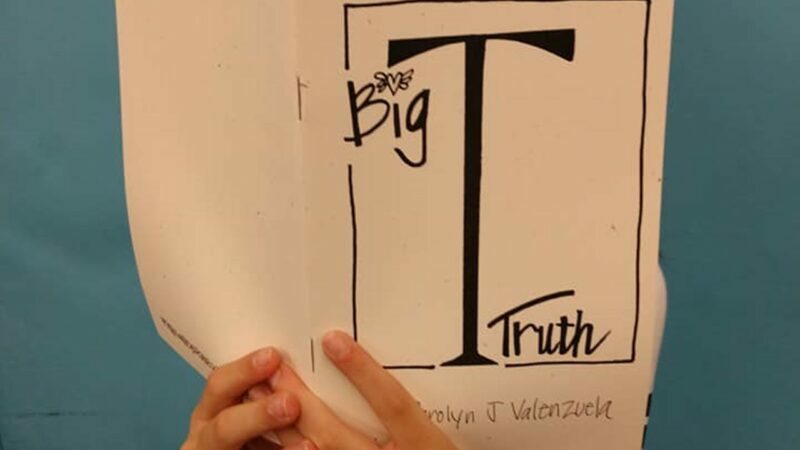 “Big T Truth” is a great gift for adults and thoughtful offering for children. The book came to be for my mother during the initial stages of her forgetfulness sparked by my father’s death. Sitting in silence was painful. Her thoughts ruminated around her loss. Being asked the questions about what was true for her opened the door for her to find herself again. In a similar way, children build self-confidence by voicing their truth in a relevant way. When shared in a classroom setting, their ideas are expanded by hearing the answers of others. Carolyn J Valenzuela is both the author and illustrator. Her artwork invites the reader to color in the blank spaces on each of the black and white pages. The answer to the question may be a single word, but the inquiry is a simple way to develop a personal philosophy. Not too bad for a little book.